Starved for some silhouetted samurai smackdown? Developer Daniel Sun of Sun Studios delivers another engrossing action-adventure game with Red Moon. 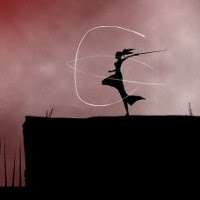 Fans of Sun’s previous work will immediately notice the visual similarities with parts one and two of the Armed With Wings series, though Red Moon eschews the lighter puzzle-solving aspects of those games in lieu of focusing squarely on combat and platforming. A beautiful and intense opening cinematic does a great job setting the stage and tone: Two samurai, apprenticed to the king, decide to seize control of the Empire. You play as Eivana, the Red Samurai who begrudgingly agrees to spill the king’s blood after some forceful coercion by her mysterious cohort. The game’s twenty levels will take you from the king’s palace to the demonically populated “Devil’s Hill,” offering up a meaty experience. As you might expect from an action-platformer, you’ll be running, slicing, and wall-jumping your way to the exit portal for each level. Combat is fairly simple, including standard attacks and power-strikes. Fill your power meter, and you’ll be able to unleash a wave of energy that will send your foes flying. This special attack is not only powerful, but is incredibly cool to see in action. Jumping around in the later levels is often more challenging than many of the battles. You’ll encounter series of tiny falling ledges, tilting platforms, and wall-jumping challenges, many of which are strung together to create some precarious navigational conundrums. The controls are solid though, so it’ll be tough to blame the game when you fall into a pit of spikes for the umpteenth time. The overall presentation is top-notch. Bookended by quality cinematics and some better-than-average voice acting, the game also includes in-game achievements and unlockables (like concept art and music). Overall, I found Red Moon to be a fun and compelling experience from start to finish. Action fans shouldn’t neglect this one.